Will Cryptocurrency Take Over Online Gaming Industry In 2019? Home Article Will Cryptocurrency Take Over Online Gaming Industry In 2019? Cryptocurrencies are designed to work as a form of medium for exchange which uses cryptography for secure financial transactions along with the verification of assets Bitcoin- was the first open-source software released in 2009 and is the first decentralized cryptocurrency. Cryptocurrency is an important innovation for both gamers and the house. The benefits are harvested by both the parties as they have a faster withdrawal process, better security and decreased operating costs. No permission has been taken from any centralized source when using cryptocurrency. Players who are accustomed to a long time for fund-transfer while playing traditional online casino games have to keep large bankrolls online. This can be a risk factor as well as an inconvenience for the player as the money has to be in a fixed account. Security is a crucial aspect for operators of online casinos. The operator stores extensive records about customers on a centralized server. Considering that millions of players all over the world play, there is a high risk of security being compromised. By the use of cryptocurrency, this serious risk can be eliminated as the operators based on cryptocurrencies do not hold their clients crypto details on the servers, neither the name, address or card number is required. Cryptocurrency makes everything cheaper and provides free slots to its users. The players are charged only the network fees. If any casino doesn’t involve fees from traditional financial transactions, then they can offer a higher percentage of payout, helping them to retain customers by providing free slots for trying out new games. CAN CRYPTOCURRENCY TAKE OVER ONLINE GAMING? There has been a lot of discussion about the scope of cryptocurrency in relation to online casino games. Although this form of currency is spreading rapidly, many operators are still not convinced. Some of the top operators and online games have started to accept cryptocurrencies. Cryptocurrency has been a phenomenon which has spread from a small interest among computer geeks to mainstream payment option. 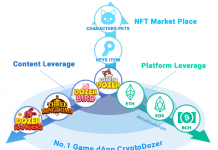 The use of cryptocurrency in gaming has been able to solve the problem of ownership of the assets which are brought in the games such as various gaming items. It essentially means that once the gamer has acquired an asset, it can remain in their possession in a digital wallet until they want to sell the asset which is in the form of a token. The gaming community is becoming more and more interested in cryptocurrency as those provide faster and safer payment processes along with security and among mostly. Cryptocurrency is trending more and more each day in all aspects especially in the online gaming industry. The day is not far when cryptocurrencies can entirely take over online games, but for that, all the countries will have to start accepting cryptocurrencies and be more open to a bit of risk in order to get a revolutionized system of currencies. Next articleWhy are there Always Reasons Why a Bull Market should not be Trusted? Is Bear Market the Norm?